Did you know that Donald Trump used to have his own university? Well, “university” is a stretch: The unaccredited program offered courses and seminars on how to do real estate deals in true Trump fashion. But some of Trump’s former “students” are pretty unhappy about the education they received. In fact, some allege it was all a scam. 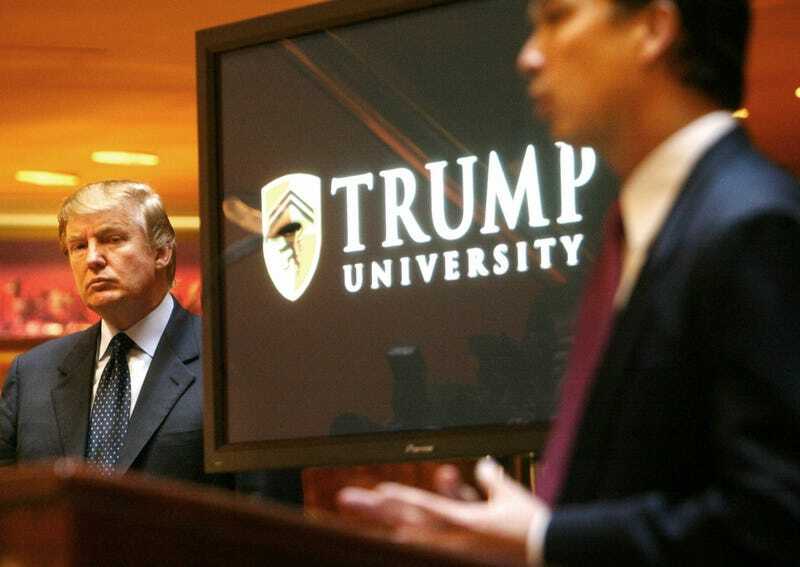 Trump University was founded in 2005 but had to change its name to the Trump Entrepreneur Initiative in 2010, after the state of New York pointed out that it was misleading for an organization which didn’t hand out degrees to use the word “university” in its name. By 2011 the New York State Attorney General was investigating Trump U and in 2013 that office filed a $40 million lawsuit claiming that over 5,000 people didn’t get the Trump-branded education in real estate sales that they had paid for. People attended Trump U seminars with the hope of learning how to flip houses. Instead, some say that they were simply pressured into buying education packages for tens of thousands of dollars. I filed a freedom of information request with the Federal Trade Commission to see what kind of formal complaints have been filed with Trump University over the years. The complaints range from the relatively minor (one woman says she never received a free iPad she’d won at a seminar) to the major (other people claim they gave Trump U over $35,000 with little or nothing to show for it). The FTC sent me a list with about 35 complaints, though it redacted the names and contact information for most of the people involved. Below are just a handful of the formal complaints filed with the FTC. I feel the Donald Trump school scammed good and honest people in believing the school would help them in the Real Estate business. For my $35,000+ all I got was books that I could have gotten from the library that could guide me better then Trump’s class did. I just want my $35,000+ money back. I feel embarrass[ed] and very dumb for falling for Donald Trump so call real estate classes. —- Additional Comments: If I can be refunded my money back, I would appreciate just that, thank you. In November 2008, both through the mail and via the Internet, I was invited to attend a 3-day seminar under the auspices of Trump University, the price of which was $1,495.00. At its conclusion on November 9, much to chagrin of everyone there, we learned that “in order to succeed” we would need to enroll in ”individual coaching” which was billed between $15,000 and $25,000. In fact, attendees were encouraged on 11/8 to call their credit card companies and request an increased credit line to pay for “a substantial purchase.” On 11/9 only 1 participant had agreed to the additional coaching. As a consolation, attendees were told that they could purchase an “Investors’ Software Package” for $2,000, which would give them tremendous advantage over the competition, and allow them to purchase properties in the marketplace before anyone else. I bought this package which arrived some weeks later. I moved from my residence on 12/15 and did not get Internet connection until 2 months later. While reading the Internet at work I came across a site that intimated that the Trump University was perpetuating a scam by offering these useless packages, which can be had for free by using the website Zillow. After several unsuccessful attempts to reach someone at Trump University I finally found an address for their Fulfillment Center in Phoenix. Because I could not reach anyone, I returned the product, unopened and at my expense, through UPS. I acquiesce that this could be considered the “cost of doing business.” However, it smacks of an underhand deal by luring prospective “students” to your course, charging a course fee of $1,495, skimming over the course content AFTER which attendees were told that unless they purchased additional products (software; individual coaching) they would not succeed. In fact, the only way to have acquired the various forms and techniques required to make the real estate deal was to purchase the program for between $15,000 and $25,000! I believe that this can be construed as unfair business practice. Furthermore, they were aware that the product was not used because I did NOT purchase the accompanying product offered, which was Internet support for $29.99 per month. I know I am not the only person duped by this scheme and concede that, if a total refund is out of the question, at the very least I should be entitled to a 50% refund. I attended a Trump Seminar in Scottsdale, AZ in August of 2010, with my husband. I was the lucky winner of the iPad door prize. They did not have the iPad in hand, so they gave me a name of a contact person at Trump Initiative. I called and never got a response from that particular person, though someone else did contact me. I have been in contact with this person, on and off (mostly off) since August. I have the emails that we have corresponded back and forth. I have dates of phone calls, but no voice record of the conversations. I am also aware that I am NOT the only winner who has not received their iPad prize. I keep getting the response that they have not recieved their supply from their supplier. I have tried to resolve this issue on my own to no avail. I need assistance. As well as the other recipients. Unfortunately, I do not know who they are except for one. —- Additional Comments: To finally receive the iPad in question. At this point in time, since the new iPad 2 is out, I would like an upgrade for having had to wait so long. I got divorced in October of 2008. I came across Trump University’s ad in the newspaper in May 2009. I had been thinking about a way to invest/start a business. The first seminar was free. Information at this seminar made it seem possible that I could invest in real estate. I paid 1,495.00 to attend a three day seminar, where I would be taught how to invest in real estate. I made a point of telling them from the beginning that I would need someone to walk me through a deal, since, I have multiple sclerosis and had a stroke. I was assured that this would happen. At the second seminar, I learned a bit more, then was asked about my credit cards and savings. At this point, I really believed I could do it. I then, foolishly, “invested” in more classes. I paid for the Trump University “Gold Elite” package. The program completely failed to live up to its promises, and therefore I requested a refund, but have received no refund to date. At the end of their 3-day training (for which we paid an additional sum) we signed up and paid for the “Gold Elite” package for an additional $34,995 based on the promises it would successfully launch our real estate investment business through the specific promised deliverables primarily of the mentorship. The program as a whole—and especially the mentoring—has been an absolute, utter waste and completely failed to live up to its promises. Promises of mentoring from the Foreclosure training in April of last year included: The trainer (James [redacted]) saying that the mentor will walk us through the first deal to completion. James said specifically, “during the mentorship visit Rick [redacted] will: 1. help walk you through, run numbers and analyze properties, 2. write offers, go to contract on properties; 3. will interview sellers, attorneys, and others; 4. will help you write multiple contracts to purchase several properties at the same time; and 5. will set you up with a lifelong investor plan. James continued to say that, “90 days after the 3 day visit, there will be a follow up with Rick and James to help make sure it (your first property) gets sold.” Overall, the Trump University program has set us back farther than if we had not had a mentoring at all since it sent us in a wrong direction from which we had to recover and restart. We have had to take on other courses and mentoring to get us going in a productive direction. And it has been extremely costly. After the company failed to give a positive response based on my letters and calls, I have recently engaged an attorney who has also written to them. Trump University failed to respond to his letter within the allotted time. So, so far the complaint remains unresolved..
Prosper Inc. / Trump Institute and its representatives agreed to provide me with a real estate training mentorship to create a real estate investing business that could earn, according to their representatives, up to tens of thousands of dollars monthly income and potentially much more. My enrollment was based around my need to learn every legal facet of real estate investing designed to create a new income stream for me. This was based on the fact that I had no real estate investing background or knowledge of how to navigate this business due to my purely creative background, which all of the Prosper Inc. / Trump Institute representatives were made aware of. Since the beginning of their $9,495 program, I have concluded that Prosper Inc. / Trump Institute representatives misled me consistently, and did not provide what I signed up for. I have come to the additional conclusion that neurolinguistic programming and high pressure sales tactics based on the psychology of scarcity are used by their representatives to get observers to become participants in their program. This included direct enrollment by their staff with an HSBC/Prosper Learning credit limit for supposed real estate transactions but truly to purchase their program as well as having their staff review interviewees’ financial status during the interview call to assess their investment capabilities, for the Prosper Inc. / Trump Institute program, of course. These are unethical tactics designed to get a large investment from the prospects and then not teach anything of validity. Furthermore, their legal disclaimers do not provide them the leeway to utilize unfair and deceptive business practices at their gain and their students’ peril—students who place their trust in them at a costly price. It is a highly irresponsible and unlawful on their part as well as extremely deceptive. My final conclusion based on discussions with counsel is that there was a gargantuan amount of misleading, fraudulent, and predatory behavior taking place that suggests legal cause for action. Because of the fact that they comingled the opening of a credit line with HSBC, Prosper Inc., and Trump Institute with high pressure sales tactics, fraudulent claims, gathering of financial information without considering whether or not students could pay back their lines of credit, THEIR LEGAL DISCLAIMER IS NULL AND VOID as this violates state and federal criminal statutes in many ways. Consumer says she paid 1500 for a Real Estate class. Consumer says they also paid 20,000 dollars for a coach plus 30 extra dollars. Consumer says he has not called or contacted her in over a month. Consumer says the coach did nothing. Consumer says she was to get other classes. Consumer says they only offered them another mentor not their money back. Consumer says she found out the mentors was sub contractors and scammers. Consumer says she did not get a two year program so she could learn everything about the real estate business.